I love poetry, rhymes and any arrangement of words that makes them uplifting and singsongy, or forces my brain to find meaning in each and every verse. I’ve been making cards for my parents and loved ones for what seems like forever. I even applied for my dream job once as a card writer for Hallmark. Too bad they are located 1,500 miles away from me. Stupid logistics. Anyway, because poems are such a huge part of my life, I wrote twenty-one of them for Theo’s Mythic. Ten as openers for the games Theo confronts, and eleven interspersed throughout the book to engage the reader on a deeper level. Because let’s face it, you can have a lot more fun and infuse oodles more intrigue into a poem than you can into a block of copy. Poems are like the word ninjas of the literary world, fraught with mystery, poise, precision, and a healthy dose of crazy. And I love me some crazy. Frail and bent upon a breeze. That held it firm instead. Are the Onlys who get to see it. Earn their passage to that hill. So fun! And the poem begs the questions, “Who are the Onlys?” “Why are they so smart?” “Where is that awesome house?” and finally, “What the heck does craggy mean?” Is craggy even a word? 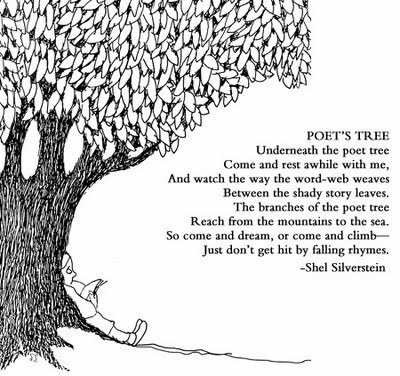 Shel Silverstein is a poetic genius and Dr. Seuss certainly knew what he was doing and was the master of whimsical rhyme. Dr. Seuss is one of my all time favorite literary ninjas because he would skewer every word that didn’t have a rhyming partner by making one up – bam! Boy oh boy could he make up the most farcical words, too. Case in point, “shorth” – which, according to Dr. Seuss, “Shorth is better than length.” Short for shortened length – so shorth plays the part beautifully. Curtain close. But truth be told and ideas be mine. For example, “Like water finding its way around,” means that nothing was getting in the way of Theo absorbing the information he was destined to know. Knowledge would be his as soon as he cleared his mind of all the extra baggage he didn’t need. Poems are like crafting a well-built house out of carefully selected sticks. By piecing each one together flawlessly, you have constructed not only a place to live, but also a work of art. Verses on canvas that take hold of the beholder and draw them into a deeper and more magical level. The art of the rhyme is like no other because, whether you intend it or not, your brain goes into instinctual meter mode and the pulse of the words click through to a conclusion automatically. A lyrical ride for your senses. So while Hallmark doesn’t allow telecommuting, I’ve chosen the path of novels to give my poems a home…way up on that lonesome hill, amongst the craggy trees. This entry was posted on Friday, September 13th, 2013 at 3:11 PM	and tagged with author, Children's Books, Dr. Suess, Hallmark, poems, Poet's Tree, poetry, rhymes, Shel Silverstein, writer, Writing and posted in Poetry, Theo's Mythic, Writing. You can follow any responses to this entry through the RSS 2.0 feed.